Yoshihiro Kamegai stops Tim Hunt and claims OPBF title! 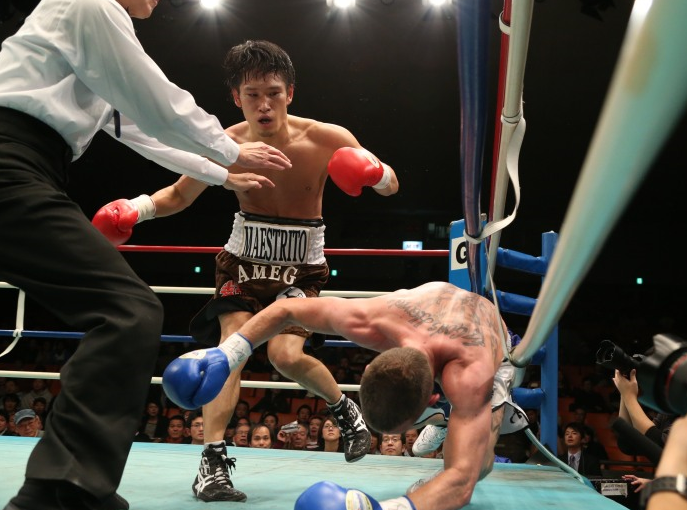 One of the few active Japanese fighters who has made an impression stateside is Yoshihiro Kamegai (23-1-1, 20). The former Japanese Light Welterweight champion has fought 3 times in the US beating Hector Munoz, fighting to a draw with Jorge Silva and suffering a defeat to Johan Perez. Today Kamegai returned to action for the first time since his disappointing defeat to Perez and made a state stopping Australia's Tim Hunt (16-4, 6) and claiming the OPBF Welterweight title. Hunt entered the bout as the #1 ranked OPBF fighter and showed good movement early on. It was as if Hunt had seen how Perez had beaten Kamegai and wanted to use a similar game plan. Unfortunately for Hunt however he lacked the toughness of Perez and it didn't take Kamegai long to connect with his nasty power. The good start of Hunt's was completely undone as Kamegai began to land his thunderous shots to the mid-section. It was those shots to the body that began to slow down Hunt and with the Australian slowing Kamegai got to work, finally stopping Hunt in round 5. Kamegai, as a result of this victory, is now the OPBF Welterweight champion. We hope this will lead to major fights domestically between Kamegai and Suyon Takayama or Takayuki Hosokawa or even Akinori Watanabe. Hard hitting Japanese Welterweight Yoshihiro Kamegai will make his return to action in December as he attempts to claim the vacant OPBF Welterweight title in a meeting with Australian Tim Hunt. Kamegai, who was beaten last time out by Johan Perez, sports an impressive looking record of 21-1-1 (19) and is a former Japanese Light Welterweight champion. He's a hard hitter who is usually fun to watch though he did look surprisingly flat against Perez in what was a hugely disappointing performance from the Japanese fighter. Fighting back in Japan and with the prestigious OPBF title on the line we expect to see Kamegai back to his best. Hunt, the co-challenger for the vacant title, has a less impressive ledger which stands at 16-3 (6) though he is the reigning PABA champion at 147lbs.